Google’s acquisition of Motorola (s mmi) isn’t just about the Android mobile market. In addition to giving Google some mobile hardware capabilities and patent coverage, the purchase could also be a big boost to Google TV. (s goog) But to make that happen, Google TV will need to shift its positioning from an operating system that is sold to consumers to one that will be used by a number of pay TV operators instead. Introduced to much fanfare last year, the first generation of Google TV products has largely underwhelmed consumers. Logitech, (s logi) which invested heavily in the OS with its Google TV Revue set-top boxes, has taken a huge hit from the lack of interest in the product. It recently slashed the price of the Revue boxes from $249 to $99. Sony (s sne) has also heavily discounted its first generation of Google TV products, slashing the price of its entry-level 24″ Google TV product in half. While the second iteration of Google TV shows a little more promise, with a more open app ecosystem and improved user interface, Google would still largely be playing catchup in the home device market. Apple (s aapl) has sold more than a million Apple TVs, and Roku is on pace to have more than 3 million of its streaming boxes sold by the end of the year. That’s not even counting the millions of TVs and Blu-ray players from manufacturers like Samsung, Vizio and Toshiba that all have their own app ecosystem. 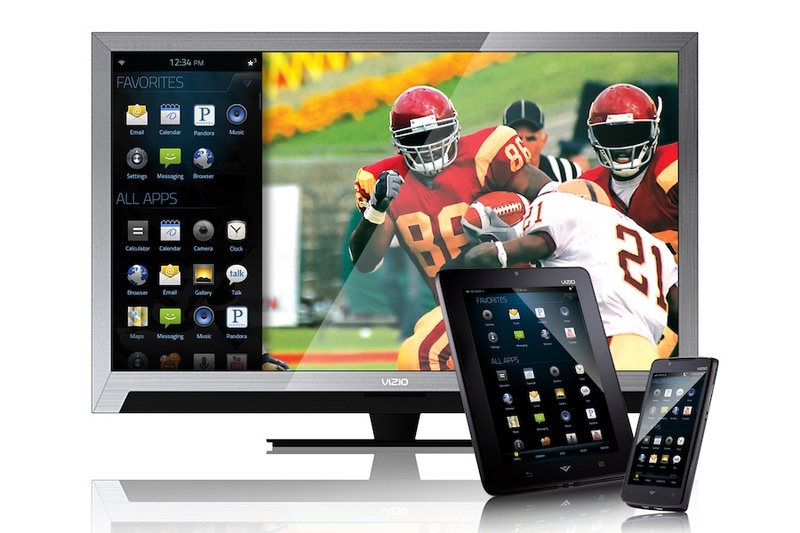 Google TV will get some benefit from existing Android applications, as they can be easily ported over to TV products. But with so few actual devices sold, Google might have difficulty giving developers a reason to build TV-specific applications, especially when there are so many other TV operating systems to choose from. That could all change, as Google just bought a very strong player in the set-top box and home devices market. According to Infonetics, Motorola Mobility was the leader in set-top box revenues last year, and was also tops in hybrid IP/QAM set-top boxes — that is, the boxes used by operators like Verizon (s VZ) that combine broadcast TV and over-the-top applications. By leveraging Motorola’s position with carriers, Google can better solidify its bid to expand Google TV and Android into the living room. Many operators are using IP-based services in a bid to improve the user interface of and add applications to their set-top boxes. Comcast, (s CMCSA) for instance, recently unveiled a new cloud-based UI for its set-top boxes, and other operators — like Time Warner Cable (s TWC) and Cablevision (s CVC) — are looking to follow suit. Until now, most set-top boxes have run proprietary operating systems. As a result, offering up Google TV as the underlying OS could simplify and accelerate the rollout of new applications on cable systems, which could improve the overall user experience on the set-top box. And by pitching Google TV as the underlying OS for Motorola set-top boxes sold to TV operators, it could very quickly create a large install base for developers to build applications for. The one question is how open that set-top box will remain if Google shifts from a consumer- to a carrier-based model for Google TV. Operators in the TV space have been notorious for keeping their set-top experience a walled garden, and it’s unclear if they’d be willing to have their live TV and video on-demand services alongside applications like Netflix (s NFLX) or Hulu Plus. Then again, before the iPhone and Android took over, no one thought the mobile operators would embrace an open app ecosystem on mobile handsets either. Gogole needs support from the Networks, but the ACE in the whole is a promise to help them keep and expand their monetization stream; they can also point out what happened to he music industry when they fought the technology and lost their business model. Motorola makes enough STBs that Google will have impact here no matter what, and JAVA a core aspect of Android was designed to run on STB so technology is only coming around full circle. Finally if Google can get PACE or Cisco to also adopt it’s Android/Google TV then the future is very bright indeed. Android, because it’s open source(partially), gave carriers more control on their handsets. But google still was able to inject it’s ads into the platform. If Google could find some similar arrangement, of open source google-tv device, with some closed, really attractive features that help the MSO’s , things like better ad matching and google+ Hangouts it might interest the carriers. In parallel ,google could talk about selling a disruptive google-tv as the stick in this equation. I seriously doubt this is going to bring GoogleTV back from the dead. The companies can easily jump ship to a new hardware provider, my current boxes are Cisco. I’m very happy with my $99 Logitech Revue Google TV. After a week of solid usage, I’d love a second one in the bedroom. The platform did not fail. It’s simply the first version. I am looking forward to the Honeycomb update. I use it as my main music source now. The Pandora app is works as expected. Turntable.fm in the living room really does rock, and plays nice in the browser. Color me dubious. Google TV is a dual case of lack of Hollywood content (or any media catalyst) and a non-intuitive user experience, not to mention the lack of cost-competitiveness. Google is persona non grata in Hollywood specifically because they aspire to disrupt and commoditize Hollywood. The Motorola tie-in doesn’t address either of these dynamics. Moreover, all of this gets back to the nut of the acquisition itself. Does Google really want to deeply integrate 19K old-world hardware types into their 29K person new-world software business, and take both the culture and margin hit that goes with that? Better to remain loosely coupled, be a good listener (with Motorola’s MSO customers) and try to emulate what they learn to a broader ecosystem — than to try and integrate, thereby polluting their cultural core, and affirming their hardware ecosystem’s worst fears. I wouldn’t confuse the tail with the dog on this one, and I am doubtful that Google will either. Will Google keep the STB division? Or spin it off as peripheral to their mobile interests? If Google does keep it can they actually come up with a strategy to get MSOs to take Google TV the feature on some Motorola STBs? Or will it get ignored like all the other features Motorola or Cisco developed over the years that didn’t fit with the MSO’s ideas of what they wanted from a hardware partner (identical cheap hardware from multiple partners they can pit against each other, all running their software). Or will Google try something ham-fisted only to be ignored like they should expect to be? Will they do the obvious and go retail with a Motorola/Google DVR/Google TV product? Will it sell? Given how moribund Tivo is they can certainly replace them, but that’s barely enough to keep Tivo alive, let alone Google’s ambitions. Can Google spend the right amount of money to get what they want out of the FCC or Congress in the area of cable cards, DTAs, AllVid, etc and actually redefine what TV means in North America? my ATV, or is it aTV, appears to have been laying in development, I welcome the competition! As others have mentioned, MMI’s customers are the MSO’s who hate the idea of Google or any other app/service cutting them out of the loop, not the end consumers. The GoogleTV will always be a flawed consumer device; they will never be greeted with open arms into the MSOs’s world of settop boxes. Not a help at all. Since Google TV doesn’t offer closed captioning, I won’t be interested in their offering as well as many others who are hearing-impaired. That headline is only true if you define “Google TV” as some new product completely unrelated to the current Google TV. @Hardie – It’s true, the Google TV I’m talking about is not the product launched last year, but the idea of Google TV as an operating system for set-top boxes and Internet-connected devices in general. Am I missing something, or wasn’t Google’s acquisition of Motorola MOBILITY? As in the part SPLIT FROM THE SET TOP BOX business?! This helps them none at all with Google TV. Motorola’s other division owns it. The MSOs have a long history with Motorola hardware. If they don’t want Google in, Google won’t get in, but they just bought themselves a lot closer. I’m sure a lot of MSOs (execs, etc) had some Motorola Mobility stock as well. There is a huge battle looming over the “family OS:” the platform that a family will standardize on for mobility, entertainment, etc. Right now, it seems that Apple has the lock on that (iTunes is a platform that goes across mobile and TV, not just a poorly-designed app to manage music and video). This acquisition, with all of Motorola’s set-top box assets (those are part of mobility), provides Google a lot more to build upon in that looming battle. But this acquisition is more than that as well. It’s about getting close to carriers (something Apple already has). And with the explosion of mobile data usage, Google needs this relationship in order to continue growth in its core ad business (about 97% of its revenue; there might be some credence to divesting that with this purchase but that remains to be seen). If they get hooked to the carrier as a handset manufacturer, they could potentially integrate core Google software in the device and OS (specific to the handset, not the general Android kernel) that would be VERY enticing to carriers to generate incremental ad revenue of which Google takes a spiff. Regardless, this is a really good acquisition for Google and Motorola. Google TV failed because there was no content available, and there was no content available because the MSO’s wouldn’t allow it. Owning a set top box manufacturer is not going to solve this problem, because the MSO’s see Netflix and Google as two of the biggest threats to their business. With this announcement, I’d bet they are meeting today to figure out how they can move the remainder of their STB purchasing to Cisco, Thomson, Pace, and Samsung as quickly as possible. No that’s not quite true. They could sell a RETAIL product (bypassing the MSO’s who might toss the Google TV software on the floor, or force it to submit to restrictions by the media companies who they are slaves to) AND they could fight the good fight against restrictions. Remember when Boxee was updating their software in a running battle with Hulu TV to make sure Hulu (free) ran on Boxee? Before they gave up? Google could do that. Make it impossible to distinguish a Google TV box from a laptop running IE say (video doesn’t work? push this button and we’ll lie to them and try again). Force the media companies to either play video over IP or NOT. GoogleTV was only a flop because it was over-priced. There is no way the Revue should have cost $249, as neither its manufacturing cost nor the market justified that price. They are probably clearing inventory at $99, so they may not get to see what really happens at that price, but for $99, it’s a far better deal than the Roku or Apple TV competition. Sony also overestimated its value when integrated into a TV set; it probably added maybe $20 to the cost of the TV, but they jacked up the price a lot more than that. Yup, they should have used the ARM Processor as the main platform to support the Google TV ecosystem. That’s what they are doing now and that is how Google TV is going to be a huge success. This is in response to ARMdevices.net, but there was no submit button associated with that post. As I’ve been working with my Revue over the past couple weeks, I think the decision to go with Intel was predominately for the CE4150 SoC chip. I believe this was the chosen platform to debut Google TV because it greatly satisfies the concerns of the content providers. The security on this device has definitely impressed and frustrated me. I’m not aware of any ARM equivalent that integrates the security aspects and high video performance, simultaneously capturing and broadcasting 1080p. Sure, ARM may have been a less expensive processor, and from that standpoint, brought the manufacturing costs down, but what Intel provided, made the platform as user (un)friendly in the eyes of the entertainment industry. They didn’t need an Intel chip to run this box. That was their choice, but it made the product too expensive. They could have used a cheaper ARM or even MIPS device, as there is nothing this box has to do that can’t be done on single chip media players. Also, 2 GB of flash would be plenty, and even when this product was introduced, that wouldn’t have cost more than $5 (now a lot less). The $99 Roku and Apple TV boxes have enough power to do what the Google TV does, and they aren’t losing money on them. Even if it was another $30, it would have been in the ballpark, since it came with a keyboard, but Logitech wasn’t even close. Making inappropriate design choices doesn’t invalidate the market, unless you are saying the product is possible without those components. I am certain it is.